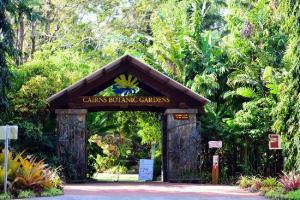 If you have some free time the Flecker Botanic Gardens are located on Collins Avenue 4 km from Cairns CBD. If you don't have a car, there are bus services or you could take a taxi. A wonderful way to spend a couple of hours admiring the beautifully maintained Gardens which display an excellent variety of tropical plants, both native and exotic. There is a fernery, orchid house and a great area showing examples of plants used by Aborigines for bush food and medicine. The garden cafe is open 7 days a week from 9.30 to 4.30 and guided walks are at 1pm Monday - Friday. The Botanic Gardens are open from 7-30 - 5-30 Monday - Friday and 8-30 - 5-30 Saturday and Sunday. Entry is free although a donation is welcome. Across the road from the Botanic Gardens is the Centenary Lakes Boardwalk. From the Boardwalk you can observe typical rainforest species including giant paperbark trees and Pandanus. The freshwater lake contains aquatic plants, tortoises and water birds. There are BBQ's and a children's playground. Waterfalls, lakes and lagoons are everywhere in North Queensland. We suggest hiring a car and visiting some of these amazing spots. Crystal Cascades is only a 20 minute drive from the CBD and is a beautiful spot to spend at least a few hours. Lake Placid is also very close to town. Heading south from Cairns you could visit Josephine Falls which has a natural slippery dip - lots of fun! The Boulders are close by and are steeped in Aboriginal Legend. 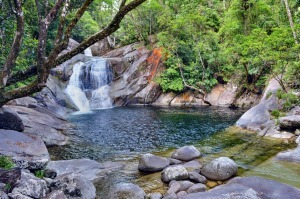 North of Cairns is Mossman Gorge which is also an excellent spot within a National Park. There is a ring walk which is well worth doing. The water is invigorating and absolutely clear. This is a truly beautiful spot. The Tablelands have some ancient volcanic craters such as Lake Barrine and Lake Eacham which are beautiful. Lake Tinaroo is a large man made lake with plenty of watersports available such as waterskiing. The Millaa Millaa Falls are picture perfect and the Malanda Falls are fun for a cooling dip. There are so many to choose from. I have only mentioned a few of the more popular and easy to find locations here. 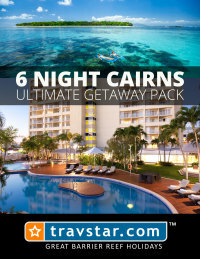 There are a number of guides available at News Agents and service stations in Cairns which are more comprehensive. This self drive itinerary offers a handy guideline to base your day of exploring Cape Tribulation and the Daintree Rainforest. 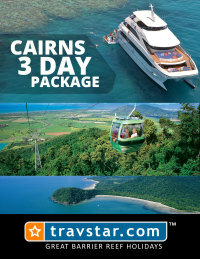 Depart Cairns 7:30am and Port Douglas at 8:30am approx. From Cairns, travel north for 80km along the Cook Highway to Mossman. In the centre of Mossman turn left into Johnston Road. This 5km bitumen road leads directly to the Mossman Gorge car park. 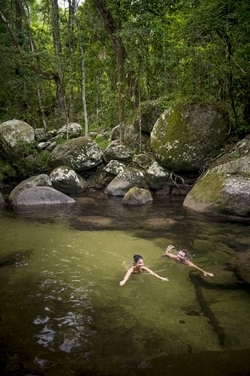 Crystal clear water cascades over large granite boulders in the Mossman River gorge. There are two circuit tracks. A short, 400m track provides access to lookouts over the Mossman River. Beyond this is a 2.7km loop track through the rainforest. There are many river tours operating frequently throughout the day, some offering a short crocodile and wildlife spotting experiences while other interpretive cruises cater for special interest groups such as birdwatchers, naturalists and photographers. Bookings not required. The Daintree Discovery Centre is an award-winning world class interpretive facility that allows visitors easy access to this unique rainforest wilderness via boardwalk tours, a 23 metre high Canopy Tower, Aerial Walkway and comprehensive Display Centre. The Discovery Centre offers visitors an opportunity to learn about and explore one of the few remaining unspoiled pockets of lowland rainforest in Far North Queensland. Whet is a popular cafe for lunch in Cape Tribulation. This cafe and bar is a great venue for the busy explorer, a lunchtime salad and sandwich buffet is on offer, as well as a lunch and snack menu for those with a little more time to relax. This is the showcase beach of the area. 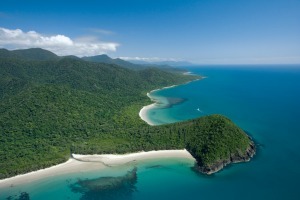 Protected by the Cape Tribulation headland, the water here is almost always calm and crystal clear. Take the boardwalk up the headland to the view point that provides magnificent views of where the Rainforest meets the Reef. This interactive boardwalk has informative signage describing the unique plantlife including 'wait a while' spiky lawyer canes, cannonball mangrove and a superb fan-palm forest. This 1 km walk is easy and runs through a pocket of rainforest and mangroves. the walk is managed by the National Parks service and is very well managed. Don't miss stopping at The Icecream Company on your journey home, it is a must for any daytrip to Cape Tribulation! All the ice creams are made on the premises from tropical fruits grown in the company’s own orchards such as Black Sapote, Soursop, Wattle Seed and Jackfruit. The ice cream is primarily sold as a fixed sample pack - four flavours in a rather large cup for $5. Journey through an ever-changing tropical landscape, a patchwork of white sandy palm-fringed beaches, waving cane-fields and jungle clad misty mountains. See lush rural farmlands bordered by World Heritage listed rainforest and the majestic Daintree River. Heading north from the little sugar town of Mossman the road sweeps through sugar cane farmlands and, next to the picturesque Mossman Golf Club, is the turnoff to beautiful peaceful Newell Beach with it’s pristine sands and Coral Sea views. Further on is the turnoff to beautiful Whyanbeel Valley, home of Diane Cilento’s famous open-air playhouse. Diane puts on a number of world-class productions every year. From Rocky Point a vista opens up of the northern rainforested ranges towards Cape Tribulation. Shortly you pass through rich beef-cattle pastures and soon reach the turnoff to idyllic Wonga Beach, miles of unspoilt sands with no major development - just a tropical beachfront caravan park. Next in view are a commercial fish farm, beach horse rides, wildlife sanctuary and tropical gardens, then the turnoff to the Daintree ferry and Cape Tribulation. 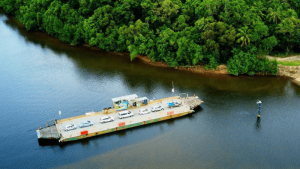 But to reach tiny historic Daintree Village drive straight ahead – here the road winds through the rainforest and soon you catch your first glimpse of the awesome Daintree River, with it’s prehistoric inhabitants the salt-water crocodiles. The final stretch into Daintree Village winds through undulating farmland and luxuriant tropical vegetation with a beautiful mountain backdrop. Daintree was originally a settlement for timber-cutters and, until the road was completed in 1933, only accessible by river. Today tourism and farming are the main industries and the region hosts every type of accommodation option from budget to 5-star resorts, B&B’s and hideaways, wildlife-spotting river cruises, artists’galleries, interpretive walks and restaurants. You can get to Undara by sealed road - a half day scenic drive by car from Cairns or Townsville (with suggested self-drive itineraries). 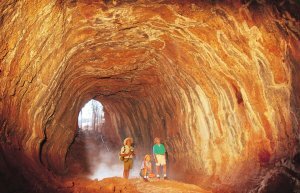 Undara Experience is easily accessible by car, 4WD or campervan. We have a range of suggested self-drive itineraries. All car and campervan rental companies allow their conventional vehicles to go to Undara, or have offered discounted rates on their 4WD hire vehicles. The road to Undara is now sealed the entire way from Cairns. Sections between Mt Garnet and 40 mile scrub National Park are narrow and drivers share the road with an icon of Australia’s outback, Road-trains. (Some up to 50 metres long). PLEASE DRIVE CAREFULLY and keep an eye out for kangaroos and cattle wandering onto the road. Undara Experience is 275 kilometres south west of Cairns. It is between 390 and 510 kilometres northwest by road from Townsville, depending which route you take. A variety of scenic routes are available if you are travelling in your own vehicle, or a rental car. Approximately 4 hours driving time. 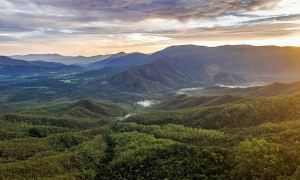 Take the turn off at Smithfield, 15 minutes north of Cairns, and climb the scenic Kennedy Highway up the Kuranda Range, stopping off at the popular lookout to survey the patchwork of fields and cane farms beneath. At the rainforest village of Kuranda, browse in the funky Kuranda Markets, visit the Australian Butterfly Sanctuary or see a cassowary at Birdworld Australia, before continuing west to Mareeba, centre of the market gardening area. Have a ‘Driver Reviver’ break at the Mareeba Coffee Works, or continue for some 30kms to stop off at the unique Fascinating Facets and the Crystal Caves in Atherton. From here the highway continues to Herberton, a picturesque village in the highlands where you can visit the historical museum and walk through the homes of the tin miners who found their fortunes here centuries ago. Follow the signs to Ravenshoe where the Wind Farm heralds the town’s entrance. After Ravenshoe head further west to Innot Hot Springs – 32 kilometres. Innot Hot Springs is a natural mineral springs located between Ravenshoe and Mt Garnet on the Kennedy Highway. The hot springs of Nettle Creek have long been established as rejuvenating and healing. Throughout the sandy creek bed bubbles hot water and many locals and visitors come here to sit in the shallows of the creek and enjoy the healthy properties of the hot springs. Next door is the spas and pools of the Hot Springs Village. There are seven pools to enjoy all at different temperatures. The water of the springs gets up to 75 degrees Celsius. The next town along the journey is Mount Garnet. After driving 53 kilometres out of Mount Garnet there is a sign that says Undara Lava Lodge is another 45 kilometres. After you go through the Forty Mile Scrub National Park you will see a sign to Undara. Turn here and head towards Mount Surprise. The turn-off to Undara is 18 kilometres along this road. Turn left and travel towards the Undara Lava Lodge. Travel along a sealed road for 14kms, through the Whitewater Cattle station to Undara Experience. Approximately 5 1/2 hours driving time. From Cairns head south along the Bruce Highway to the town of Gordonvale. There you turn right at the signs for the Atherton Tablelands and proceed to the Gillies Range. 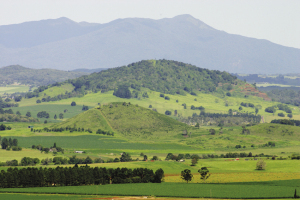 This Range is 19 kilometres and once you reach the top, you are on the Atherton Tablelands. For a short scenic stop, we do suggest you call into Lake Barrine or Lake Eacham. Continue toward Yungaburra and follow the signs to Malanda. The Malanda Visitor’s Centre & Malanda Falls are well worth a visit. On the outskirts of Malanda turn left and follow the signs toward Millaa Millaa. Continue until you see a turn off marked Ravenshoe and you can follow this up a small range where you can make a brief stop at the Millaa Millaa Lookout. This is a great spot to take photographs of the beautiful Atherton Tablelands (depending on the weather conditions). 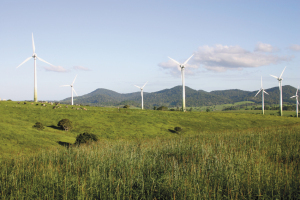 Follow the signs to Ravenshoe where you may wish to visit the Wind Farm. Travel a further 14kms through Whitewater cattle station on a sealed road to Undara Experience. Drive north from Port Douglas towards the sugar cane town of Mossman, and turn left onto the Rex Range Road. At the top of the range, after Julatten, turn left at Mt Molloy and follow the highway south towards Mareeba. Just 10kms before Mareeba at Biboohra is the Mareeba Wetlands nature reserve and Savannah Guide Station. Tours take about 2 hours and include billy tea and biscuits. Continue from Mareeba in a southeasterly direction through Herberton to the Mt Hypipamee National Park and the Crater, a huge volcanic vent in the ground well worth the short walk in to view. Follow the signs to Ravenshoe and further west to Innot Hot Springs – 32 kilometres. After you go through the Forty Mile Scrub National Park you will see a sign to Undara. Turn here and head towards Mount Surprise. The turn-off to Undara is 18 kilometres along this road. Turn left and travel towards the Undara Lava Lodge. Travel through our neighboring cattle station, Whitewater Station, on a sealed road for 14kms. From Cairns head south along the Bruce Highway to Innisfail where you turn right onto the the Palmerston Highway, named after bushman Christie Palmerston. You can obtain maps from the Innisfail Tourism Information Centre before you leave and everything is very well signed. This scenic rainforest drive takes you up to the Atherton Tablelands. Along the way, visit the many lookouts, waterfalls and picnic spots. Stop at the Nerada Tea Plantation, Australia’s most successful tea plantation set in lovely country around the Palmerston National Park. Dairy farms dominate the Millaa Millaa region and there are some beautiful waterfalls, cool streams and rock pools. 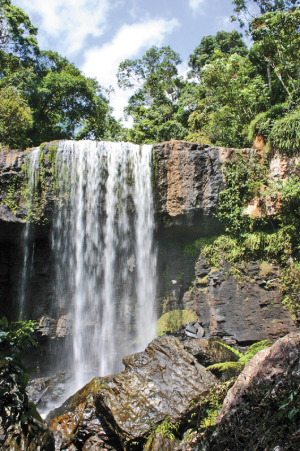 Follow the Waterfall Circuit to visit Millaa Millaa Falls, Zillie Falls and Elinjaa Falls. 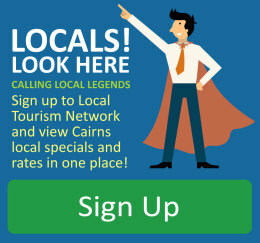 Nearby are the towns of Malanda, Yungaburra and Atherton, offering many scenic drives, walking tracks and attractions. Continue from Millaa Milla along the Palmerston Hwy, and on to the Kennedy Hwy following the signs for Ravenshoe for approximately 26km. Ravenshoe is the highest town in Queensland and has been an important centre in the timber industry. Today a new industry is stirring things up – you can check this out by visiting the Wind Farm.